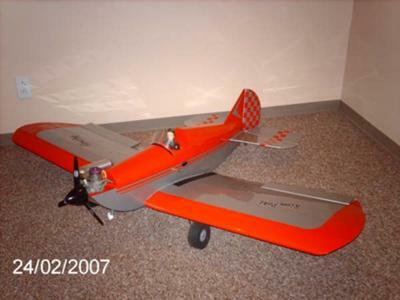 The Slow Poke Sport 40 Kit was the third RC airplane kit that have I built. I was looking for a slow relaxing plane to build and fly. The Slow Poke Sport 40 Kit by Great Planes was just the ticket. The kit is a typical Great Planes kit. Good wood and a great instruction manual that produces a good flying RC airplane. The only problem that I had in building of the kit was with the die cut 1/8” ply engine mount and doubler (EMD). I put mine in upside down, putting in left engine thrust instead of right. After cutting the EMD out and putting it back in right side up, the rest of the construction was simple and straight forward. Mine has had three different engines over its lifetime. I started out with a O.S 40 la. This is plenty of engine for typical flying of the Slow Poke but I wanted more! I now have a Tower 46 on it with a three blade Master Airscrew 9x7. Of all the props that I have tested on this RC airplane, this one gives the best all around flying. The reason for the gradual change in power is that this plane will hang on the prop with a strong 46 and a APC 12.25 x 3.75 prop. It will not do it very long, or real good, but it will do it. Another thing about this plane is that with the real short tail moment, this plane is capable of some real tight flips and spins. How long did it take you to build her? I believe it was about 75 days, working on it in the evenings. Most of the time was spent cutting out 1" squares on the tail. FUN BUILD. Great to see you enjoy this Plane.. i am currently building it and cant wait to get her in the air.. I was just curios as to how your plane is coming along. I hope you post some pictures when you get'er done. I'm also curious to hear how she flies! I've had three different engines on mine as well. I started with a Tower .46 and it did well but I'm a Saito man. Next I put a Saito .56 with a Master Airscrew 12X6. This engine and this plane were made for each other. I set the throws to the max with standard servo arms. At elevations below 1000 MSL the plane would just barely hover. Over 4000 MSL it struggles to fly the plane. It now has a Saito .91 special and Master Airscew K series 14X8 prop. It now has unlimited capabilities and will accelerate straight up. Its covered in Chrome with black and yellow checkers on the nose and turtle back. Out of all my warbirds and giant scale planes, this is the one that steals the show everytime where ever I go. I wouldn't trade it for anything. We have at our club a Slow poke but it doesn't fly very well. My question is where your gravity point is. Thanks in advance. I just picked up a nice used SlowPoke 40 ARF for my wife to fly. I need to add 12 oz of lead to the front of the plane. WOW that’s a lot of dead weight. Have you guys just added the weight to the nose?? I’m thinking a bigger engine just for the weight. I have a new Alpha .45 engine that is HEAVY but I don’t know that much about how the Alpha engines hold up. I have owned a Slow Poke for about 12 years now and It is my favourite plane and I do have quiet a few. I took it with me when I moved to NZ because I couldn't bare to part with it. It has run with an OS40 sports all its life. I've crashed it and totally demolished the wing but the rebuild works better than the original. I have had problems with it wanting to fly away and not come back but the forced landings did not result is any major damage. The down side of the original kit was that the balsa was very heavy and thus it was totally tail heavy. It would have required a total of 5lbs of lead up front to balance it. Luckily an ingenious friend of mine with a lathe turned up a beautiful pair of stainless steel wheel rims. They fitted the look of the Poke and balanced it well although they are heavy. I have been thinking of putting a 60 size in it as the winds in NZ cause some control problems with the big wing and the extra power would be helpful. It is the only plane I have come across which you can float like a kite in a good head wind. Just love it!! !